Before any revision, it's helpful to know exactly what you have to work with. Novels often change during a first draft, so any outlines or summaries you did could be outdated by the time you’re ready to revise. Doing an editorial map (or book map) lets you know exactly how the novel unfolds and where it needs tweaking. It’s also a handy reference tool when you need to check when, where, or how something happens in the novel. As you create your editorial map, keep an eye out for weak spots and scenes you know you’ll want to work on. I like to add a revision note at the end of my scene summaries, such as: Needs stronger goal, or fix character arc.This helps me quickly spot (and remember) what I want to do when I'm ready to do it. What important plot or story elements are in the scene? She meets and helps Danello (who becomes a major secondary character and love interest), gets seen shifting pain by apprentices at the Healers’ League, and has a reason to go visit her sister at the Healers’ League in the morning, which is where she gets identified and comes to the bad guy’s notice. Revision Red Flag: If you’re unable to answer any these questions, that could indicate you’re missing some (or all) of the goal-conflict-stakes plot mechanic. Once you identify the core elements of the scene, summarize what happens—the actual action and choices made. This will be a great help when writing a synopsis, as well as seeing how the story unfolds as a whole. For example: Nya is stealing eggs for breakfast when she’s caught by a night guard and the owner of the chicken ranch. She makes a run for it, and in the process the night guard (Danello) is injured. Out of pity, she heals him and takes his pain, which is seen by two apprentices from the Healers’ League, who will tell the Elders about her. She knows she’s just revealed her pain shifting ability to the wrong people. It’ll be a risk to go to her sister at the Healers’ League in the morning to get rid of her pain, but she has no choice. Revision Red Flag: If you can’t summarize the action in the scene, that could indicate there’s not enough external character activity going on. Perhaps this scene has a lot of backstory, description, or infodump in it. Be wary if there’s a lot of thinking, but no action taken as a result of that thinking. Go scene by scene and summarize the novel. By the end, you’ll have a solid map of how your novel unfolds and what the critical plot elements are. You’ll easily see where/if a plot thread dead ends or wanders off, or any scenes that lack goals or conflict--which will make your revision that much easier to do. It’ll be clear what needs work and where. Revision Red Flag: If you discover some chapters or scenes have a lot of information, while others have a line or two, that could indicate scenes that need fleshing out, or are heavy with non-story-driving elements that might need pruning. It could even show places where too much is going on in one area and readers might need a breather. Aside from the core plot elements, you can also include the critical steps in the character arc, the pacing of reveals or discovery of clues or secrets, how multiple POVs affect each other, or whatever else you want to track. For example, a mystery might have a dedicated paragraph that covers what the killer is doing, even though that’s never seen in the actual novel. These additional details can be woven into the scene summary, or kept as bullet points or a subparagraph if that’s easier. You might even have two or three paragraphs per scene: One for the plot, one for the character arcs, and one for information you need, but the characters don’t know yet. This additional information can be useful for tracking subplots or inner conflicts, as well as critical clues or what the antagonist is doing off-screen that’s affecting the protagonist. Timelines can also appear here if you need to know when events happen to ensure everything works together and you don’t have any 27-hour days. I like adding a simple time reminder at the top of every scene, such as: Day One, Morning. The beauty of an editorial map is that it’s a quick and easy reference guide for the novel. 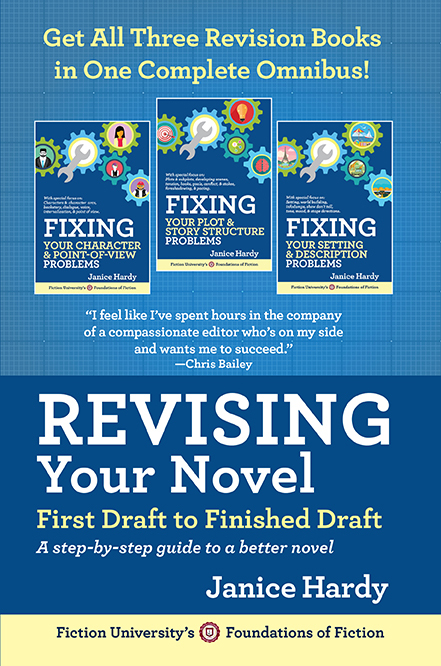 If you get stuck during your revision you can flip over, see what happens when, where the story needs to go, and get back on track. The editorial map will be your road map during the revision process. Do you use an editorial map in your drafting or revision process? Thanks for all the reminders. In some ways I'm on track (using a plot chart and mapping out scenes) but I find I lack ACTION. hmmm…back to work. Thanks - good advice as always. I have sent it to my writing students! This is great! I've been pre-plotting before writing and then making a scene map after my first draft to help with revisions, but these questions will really give me direction for the self-editing process. Thanks once again for putting things in such clear, easy to understand terms Janice. :) Bookmarking and sharing this post! No, I have not used an editorial map, but in Scrivener I do a chapter summary on the side of each chapter. At least when I behave myself. I like this idea. Excellent. I only had a list to check what needs editing, but GMC and the structure are more helpful.